Jacket, slip dress, both from Anavila. Hair and Make-Up by Devika Heroor. Styled by Shweta Navandar. Voice-over artiste, TEDx speaker, film producer, image consultant and co-founder of the world’s first ever bindi portal, Bookmybindi.com. Meet the talented Aroona Bhat, who balances all her different facets with panache. Talking to the 43-year-old Bhat — who has an unusually sunny disposition — over the phone, I try to sum her up. I already know how she looks, thanks to Instagram — striking eyes, a head of defiant curls, a hand-drawn pattern smack in the middle of her forehead. And while her proclivity for horror isn’t something I could have possibly gauged without the omniscient internet — the much-acclaimed Marathi horror film Lapachhapi (2017) was produced by her — it didn’t take me by surprise either, simply because I had known by her choice of vocations that she would be anything but run-of-the-mill. What fits in quite seamlessly though are her other career choices — image consultant, happiness coach, and etiquette and manners columnist. The idea was born during a casual get-together with some friends. We got talking and I mentioned that I’ve been drawing bindis on my forehead and documenting them for the past 10 odd years. One of my friends mentioned, “Since you have a ready bank of bindis, why aren’t you converting them into stickers so people can wear your funky designs too.” And right there was a business proposition I could not refuse! I never ever step out of the house without a bindi on my forehead, irrespective of what I’m wearing — a sari, a short dress, pants, or even my swimwear! After all these years, I can’t even imagine myself with a blank forehead! if you look at my Instagram account, for example, you will realise that I have no one favourite way of wearing it. Reason being, I never repeat a design and every day, my forehead becomes a canvas for me to create something new! I do believe it’s foolish to treat the bindi as if we have exclusive rights over it. 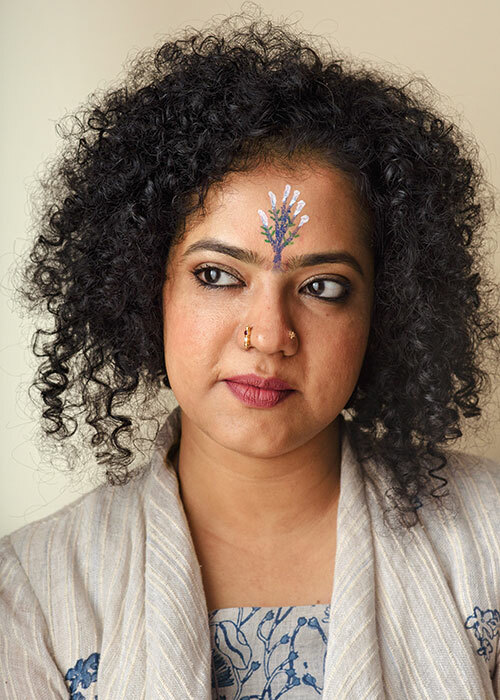 It has been scientifically proven that touching the ajna chakra — located where the bindi is placed — controls the gland which helps the endocrine function better. Since this trumps all religious grounds for wearing a bindi, I don’t see why only Indians should wear one. It’s like yoga. We thought we owned it. Now it’s become a global phenomenon! What started off as tiny squiggles on my forehead in red, black, white and maroon have now exploded into what someone described as “art on the forehead”. I express what inspires me that day through my designs and these morph with my mood. The colours almost always tell you how I’m feeling on that particular day. A bindi is as good as it has ever been. It stands for power and facilitates a state of mind that helps you make decisions and balance your actions. Whether one wants to sport a simple, traditional design or a funky one like I do depends entirely on one’s comfort level. It must become an integral part of everyone’s daily routine, just like yoga. It is an unexplored zone that can help you reach your full potential. Read part 2 with Dolly Thakore here.